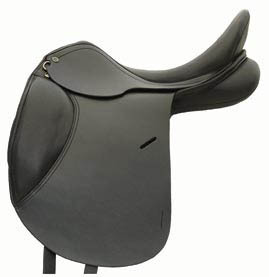 The Thornhill Danube dressage saddle features elegant styling and classic appeal. Built on a hoop style tree that is close contact and a bit shorter in panel length, we have had great success fitting this to hard to fit horses such as Arabians, Morgans and various Warmbloods. 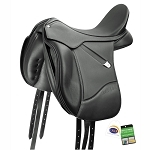 The Danube's slightly shorter and wider flap offers a wider range of leg placement as well as perfection for the more petite rider. 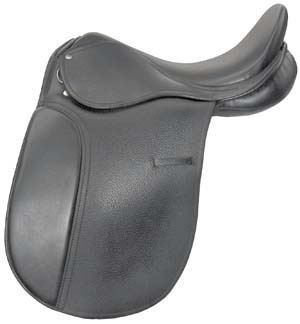 The soft seat, narrower twist and wool flocked close contact panels keep this saddle true to Thornhill tradition. A great design for a great value. Black. Size 17", 17.5", 18", 19"
Tree widths: Medium (32 cm), Wide (34 cm), Extra Wide (36 cm). "As well as being a retailer, my children and I have been training and showing exclusively in Thornhill saddles for the last 16 years, and I love the superb quality, craftsmanship, and balanced design that these saddles offer. 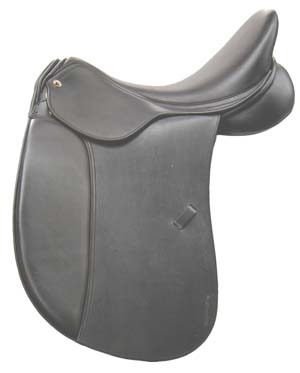 The Thornhill Danube dressage saddle has been my answer to fitting my broad built Arabian Sport Horses for years!"